Dr. Small is a sociocultural anthropologist and assistant professor at Central Connecticut State University. He holds a Ph.D. in Anthropology from Cornell University, and a Masters in International Affairs from Columbia. Research for this post comes from his book manuscript: Currencies of Imagination: Channeling Money and Chasing Mobility in Vietnam (under contract, Cornell University Press). For more information about Dr. Small’s work, visit his faculty page. The catalyst for capitalist growth in Vietnam—often dubbed Asia’s next Tiger economy—is frequently ascribed to market reforms starting in 1986. But a significant part of Vietnam’s economic growth is also supported by diasporic capital sent from abroad. Many of Vietnam’s so called “overseas Vietnamese” left as refugees and migrants after the end of the Vietnam War in 1975. International remittances to Vietnam are estimated at around 12.3 billion U.S. dollars annually, making it one of the top ten destinations in the world for money sent by diaspora populations back to home communities in the Global South. About 7-8 percent of households in Vietnam receive remittances from abroad. International remittance flows are higher than overseas development assistance to Vietnam, of which Vietnam is also a top recipient. This post looks at developments in Vietnam’s remittance sector, including how they are being framed and embedded by new monetary policies, technologies, banking and finance trends, and consumer patterns that both enhance and complicate cross border mobility. The material is drawn from my book manuscript entitled Currencies of Imagination: Channeling Money and Chasing Mobility in Vietnam (under contract, Cornell University Press). In a strange parallel to post-9/11 concerns about international money laundering and terrorist financing, there has been marked interest since 2001 in tracking international remittance flows and channels. A once largely overlooked cross-border financial flow has become increasingly visible, and public. Before 2000 the World Bank actually does not have remittance data for Vietnam. Total remittances are growing significantly, globally estimated in 2015 at 431.6 billion dollars to developing countries. But this is also connected to more definitive methods of tracking and compiling these particular financial flows. In the recent past the majority of international remittances to Vietnam traveled through informal channels, including hawala-style transfers and courier services. In the 1980s remittances largely took material form: goods sent from abroad that could be exchanged on the black market in an embargoed socialist command economy starkly characterized by scarcity. Since the mid-1990s there has increasingly been a shift to more formal transfer channels such as banks or money transfer operations such as Western Union or MoneyGram. However, the informal remittance sector remains strong as it provides long-standing familiarity with many of the ethnic community service providers, and also offers lower fees, personalized messages, and discreet home delivery services for recipients who may wish to keep the arrival of overseas money secret from rent seeking officials, neighbors, or even family members. 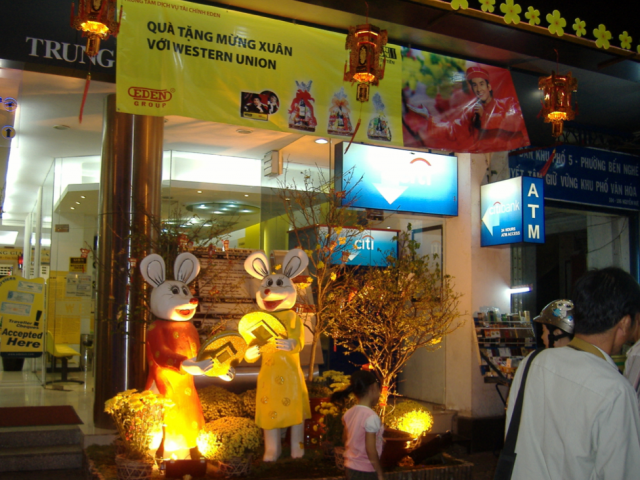 Lunar New Year (Tết) Remittance Promotions, Ho Chi Minh City Vietnam, 2009. These days there are increasing numbers of Việt Kiều (the informal term in Vietnam commonly used for overseas Vietnamese) who are coming back to work, live, and retire. There are also shorter-term diaspora returns, especially during the lunar New Year (Tết), which are almost always accompanied by personally carried remittances and other gifts with multiplier effects. These returns have been actively and symbolically encouraged by the Vietnamese government, notably since 2004 when Politburo Resolution 36 was passed affirming overseas Vietnamese as an “integral part of the nation”, followed by the amended Vietnamese Nationality Law of 2008 allowing overseas Vietnamese to hold dual citizenship. There is, of course, some controversy about the intentions of these political shifts, but there are now a number of policies and regulations in place designed to facilitate return migration, land ownership, and investment. The global economic downturn had some effect on remittances, but in general international remittance flows from diasporas are less affected by cyclical economic swings than foreign direct investment. Vietnamese remittance receivers and senders often point out that family obligations are important and cannot be ignored even when economic times are tougher; unwavering transnational financial commitments to extended kin during economic downturns have also been measured in other countries in the region such as the Philippines. Remittances to Vietnam fell only slightly by about 700 million dollars in 2009. By 2010 remittances were again on the rise and now exceed 2008 levels by over 5 billion dollars. The infrastructure for international remittance transfer has changed however. Dodd-Frank financial regulatory reforms in the United States in 2010 increased governmental oversight of international remittance transfers, challenging the working model of many of the smaller, traditional ethnic remittance companies serving the Vietnamese community in the U.S., which often operate in a gray area of financial service regulation compliance. In the meantime a number of major banks and money transfer operators have moved in to try and capture this “ethnic” financial market, further formalizing Vietnam’s international remittance corridor. Current proposals to scale back Dodd-Frank may further impact Vietnamese American remittance providers as they scramble to adapt to the changing regulatory environment. New technologies—both simple and complex—and increased inclusion of Vietnamese in the formal financial sector are also shaping remittance transfers to Vietnam. The expanding availability of ATMs, for example, open up the possibility of linked bank accounts to transfer money, although the percentage of the population with formal bank accounts is still significantly lower than most countries in the region. There is significant global attention these days on mobile phone technologies that would allow those without a back account but with a mobile phone to use their phone to store and remit money, potentially increasing financial access for the poor and lowering transaction costs. Mobile value remittance practices are starting to emerge in Vietnam, as users within the same provider network are able to transfer airtime credit via phone. There has also been experimentation with electronic kiosks where people can deposit money and input a cell phone number where the credit will be sent. Some start-ups like Momo have moved from airtime credit transfer to mobile wallet and e-payment services. The Vietnam Bank for Social Policies, in partnership with MasterCard and the Asia Foundation, recently ran a feasibility study and pilot project for mobile banking. The horizon of payment options within mobile value eco-systems is rapidly expanding – from games to bills and transport payment. Unlike countries such as Kenya or the Philippines, however, there is not yet a way to cash out (P2P) such credit in Vietnam without a bank account, which would open up an entirely new domestic remittance channel. 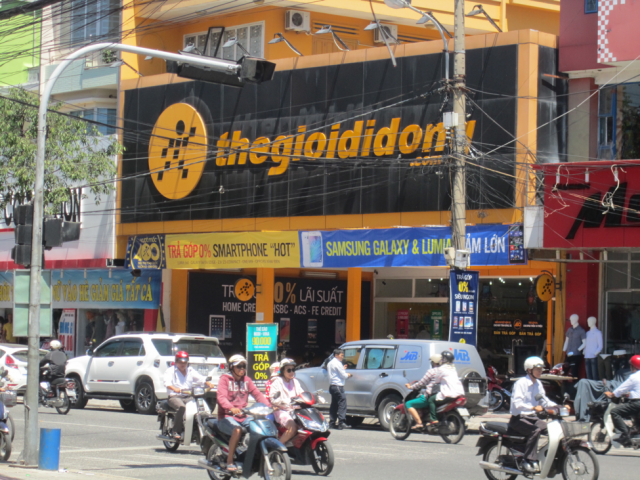 Mobile money services need regulatory approval and cooperation between banks and telecommunications operators; in Vietnam that constellation for full mobile money services has not yet happened. Remittances accompany broader cultural and migratory flows. If family remittances can be considered as gifts to kin separated by distance and time, and gifts in a Maussian sense carry intangible sensory characteristics – “spirits” – of givers, then remittances index for many the power of money and its possibilities for social transformation as imagined via diasporic bodies in another place. For many Vietnamese remittance-sending households, this “other” place is the United States, where by far the largest proportion of Vietnam’s diaspora now reside. The Cold War role of the United States in Vietnam is often associated with capitalism—an economic system previously experienced in South Vietnam, abruptly denied to the Vietnamese after 1975, and re-introduced in the 1990s, but often critiqued as crony. In contemporary Vietnam, imaginaries of “true” unfettered capitalism in America abound. In capitalism, money begets money; for many remittance receivers the money overseas Vietnamese send back affirms this imagination of how money works in an ideal capitalist environment. Not only do overseas Vietnamese send money, they also return to Vietnam and appear transformed through the fashions and lifestyles such monies afford. In Vietnam, many remittance recipients complain that money is not accumulative the way it is imagined to be in America. They say that money is easily spent, but harder to invest and grow. This is experienced in the difficulty of expanding one’s business beyond a small local enterprise without the right connections in Vietnam’s political establishment, or without access to further credit. So remittances can feed and draw awareness to these kinds of spectral frustrations and seeming capitalist contradictions. Remittances also afford new technologies that facilitate more immediate and direct communications between Vietnamese in Vietnam and those abroad. Remittances are invested in telephone calling cards, computers, and internet access, which afford ongoing transnational connections between senders and receivers. In a way such immediacy may counteract the more exaggerated imaginations of life in the United States that were previously only disseminated through media or more infrequent contact with overseas relatives living in exile, and yet it also drives migrant desires – there is a strong qualitative correlation between reception of remittances and household migration aspirations. Remittances to Vietnam from overseas diaspora are commonly used to pay for health care, housing, and education, and to support religious, charitable, and humanitarian organizations and activities. They afford business investment, and on the other end of the “productivity” spectrum, a variety of gamble and leisure consumption patterns. There are often investments in skills associated with overseas migration strategies ranging from English language study to nail salon training (a widespread occupation among new Vietnamese immigrants in the U.S.). Of the variety of material consumption patterns remittances afford, two notably consistent consumer good categories afforded by remittances discussed by my interviewees are smart phones and motorcycles – items originally and still valued for their utility to communicate and transport but also increasingly for their status symbolism. Smart phones and motorcycles are also the fastest growing consumer items for loans in Vietnam, and manufacturers are actively cultivating interest in and credit for new niche brands and models that are driving heightened purchase and turn over. It is compelling to reflect on how a variety of mobilities – monetary, bodily, material, technological and social – intersect in these spending and consumption patterns. Such intersections offer insight into the emergence and expansion of formal financial infrastructures designed to facilitate and enframe the production, transfer, and manifestation of value in Vietnam’s new capitalist economy. “World of Mobility”, Danang, Vietnam 2015. Estimated by the World Bank (2016). Although, often overlooked in the emphasis on international remittances is the fact that over 85% of households receive some form of remittances, mostly domestic urban-rural. Hawala is an informal value transfer arrangement in which incoming and outcoming funds are balanced and delivered through creative book keeping and trust / business networks without the necessity to transfer money – the name is of South Asian origin but the practice is global.